Fair play to you Sinead. Great work. We had the holliers booked and so watched bits from our hotel room. There was huge negative comment on CNN and BBC World. Where do they dig up the people (experts) to interview. I never heard of any of them. Rocker wrote: . . . Where do they dig up the people (experts) to interview. I never heard of any of them. They have some necks. I suppose you have to blow your own trumpet but, I would expect the president to be able to do a little more!!!!!!! Welcome back Rocker, I am just curious (nosey) about where you were on your holidays? Jemser wrote: Welcome back Rocker, I am just curious (nosey) about where you were on your holidays? Just a short hop to Hamburg. Got some really cheap Aer Lingus flights at start of year so did some other German cities then. I hadn't been in Berlin for about 30 years and it has changed for the worst I though. Their rail system is efficient and really cheap with daily deals for up to a party of five for about 35 E so it works out at a fiver to travel anywhere in the district for 24 hours. Ha, we are divils for bargainsbut, it makes it cheaper than staying at home !!! It seems that a van without a registration plate at the front and a UK registration number at the rear, pulled up outside 34 North Frederick Street with 15 to 20 men and they proceeded to evict the squaters. 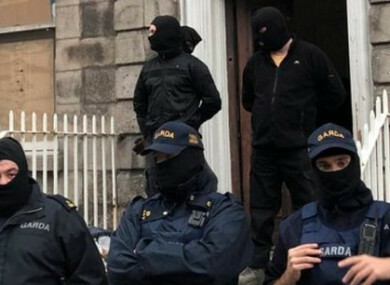 While the eviction was legal, the whole operation looks like a shambles and anything but professional .... how long would any of us be allowed drive around Dublin in an unregistered Mini-bus with over or so a dozen masked men ? Maybe GT can give us the legal view on this, but from my perch .... just like the Joan Burton Tallaght fiasco, it looks like a total PR disaster and as ill-concieved as you could possibly get. What if a serious incident occurred, how could the masked be identified ? What do you think, should our Garda be used in this manner ? Posted above, a summary of the events surrounding this eviction given in a newspaper. Interesting that the public order unit was present. Given the numbers of persons occupying the building, their presence was deemed necessary. The building owner obtained a High Court order and the men in masks may have been employees of the owner. It is not illegal to wear masks. Sherrifs in the UK do so and is permissible here when acting to repossess or carry out a High Court order to seize goods. The process of eviction from a property is certainly never pretty and should be done in a peaceable fashion and this appears to have been largely the case here, which is all that matters. The squatters have defied a court order which cannot be tolerated in any fashion. They are trespassers. The real issue here is that the owner appears to have obtained planning permission to convert the property for residential lets and the squatters presence interferes with the owners constitutional property rights. High rents aside and whether those on the housing list will be permitted to reside there, these units are needed to house our population and the squatters are blocking this. Also the building is in disrepair, which places occupants in danger and the owner potentially liable for injury claims following from incidents relating to such. I think it it is true to say that we are still haunted by the Land War of the 1880's and maybe this makes these images of such evictions, still shocking to us today. Last edited by gingertom on Wed Sep 12, 2018 7:01 pm, edited 1 time in total. Keystone cops..... not forgetting the vehicle broke several parking laws !!! The type of aggressive policing witnessed yesterday feeds the activists cause and attracts more support for their next occupation. All they had to do was form a line with their battle shields, stick together and simply hold that line .... instead they drew batons and reacted. Did they trespassers prepare themselves for the enforcement of the court order? If this story is correct, could this be the reason why Gardaí were there in such numbers to protect themselves from the occupiers defensive tactics.Eviction is not a pretty business which is made worse by non-peaceable resistance to leave undertaken by these trespassers. It doesn't mitigate unreasonable force if used by Gardaí........but it may explain it though. There is no doubt that the activists are challenging the legal system as well as those that enforce the law .... my point is that the Gardai who are supposedly there to uphold the law are in this case, blatantly allowing / protecting / enabling laws to be broken. I pointed out some traffic violations as an obvious issue, but what about the use of an angle grinder in a public place.... health and safety laws were breached in so many ways from establishing a safe work area with signage to no personal protection equipment (PPE) used, to the use of a competent person who possesses sufficient training, experience and knowledge appropriate to the nature of the work to be undertaken (rest assured a competent person would know the regulations and would not have acted in such a risky manner). Speaking of risk, I would love to see the risk assessment carried out ahead of this undertaking .... my guess is it would be made up if requested, but does not exist right now. If the law enforcers are ignoring laws, then the activists will gain support and that is not the way forward. Ps it was embarrassing to hear the Garda cry about threats made on facebook .... it came across as a pathetic attempt to gain public sympathy. Garda get abused and threatened every day, its the nature of their work that brings them into conflict with law breakers and they are trained in how to deal with it. On a much lighter note than the previous posters, I was not posting recently because I was in Gdansk. A very nice city rebuilt since the last war but done in the old style, 98% of the city was flattened. If the rebuilt did not have a year on the wall you would never know it was a new building. Great food and drink at very reasonable prices. I should really be in detox this week. My brother-in-law and his wife were celebrating their 60th Wedding Anniversary and chose Gdansk for the parties. I met up with nieces and nephews I haven't seen for 30+ years and met grandnieces/nephews I have never met previously. A great time was had by all. Good to know, I am going to Gdansk next year, what Sinead the highlights for you? Good to see your still about Toby, I thought I seen a post from you on FB (You know your from Dun Laoghaire When) a while ago and was going to send you a message, was it you then ???? Snowhite wrote: Good to see your still about Toby, I thought I seen a post from you on FB (You know your from Dun Laoghaire When) a while ago and was going to send you a message, was it you then ???? There was nothing in Gdansk that disappointed me. There is a great war museum, 3 floors underground, really interesting and informative. The shipyard is almost closed, the museum there, doesn't look too good from the outside, is great inside. I didn't get into the museum across the river. Restaurants along the river are very touristic but move a bit off this well trodden path and you will find much better value. The churches are also very interesting. Amber is available everywhere. You will need local currency, agree the fare before you take a taxi from the Airport, it should be 60 Zloty = about €13.00. All the best for your visit in 2019. It is truly amazing that schools built by the Government in recent years are, in the main, defective. When the clergy/religious orders built schools for us they stood for ever! Sinead wrote: It is truly amazing that schools built by the Government in recent years are, in the main, defective. it is not just the schools that were built to such shoddy standards. Look at the crumbling apartment buildings. During the Celtic Tiger era buildres took on any kind of fella with two hands. Chancers from all over the world flocked here and got the price of a house back in their own country for building hideous shabby edifices/houses, apartments etc. Not their fault as the builders were cutting as many corners as they could to make more money. Materials were the best they could get at the time, pyrite or no pyrite. What was that called "light touch legislation". Oh and while the Irish "breakfast roll" fella was just getting fat the E.U fellas were claiming for umpteen children back home. Every time I went for a breakfast roll myself I heard the irish lads complaining about the amount of child allowence the non Irish were getting. The lads were bragging to the Irish on the site. A bit more "light touch legislation". I don't think "on mature reflection" that it wasn't anyone's job to manage"light touch legislation". People were swamped by overwork in basic jobs and things slid off the table, off the drawing board, could be even "under the carpet". We will never really know the extent of the Celtic madness. Sad but true, Greed was the moving factor. The poor construction standards we are dealing with nowadays is a direct result of the States decision to introduce bench marking across the boards as far as I'm concerned.... suddenly everyone was passing exams, the exams were watered down and the entire education system went into 'nobody fails' mode as the teachers needed successes to justify their job. There was a time when an apprenticeship was a 7 year programme, but those in charge decided to reduce it to five and then to three if you met a certain criteria. Ireland has cheapened the trades and over-hyped the supervisory roles with a myriad of 'project managers' and 'design team' type roles ... all qualified experts BUT they have little or no practical experience as you don't get that from reading books. Compare our attitude to tradesmen with Germany's and you will see whats wrong ....... we treat the trades as a dumping ground for slow learners and at risk youths (we don't attach any value to it) while the Germans value an Electrician/Plumber/Carpenter etc in the same way they value an Architect or Engineer. They see the need for excellence from start to finish, having a great Architect is useless if those working on their designs are incapable of hammering a nail straight. I recall an old Carpenter I knew saying : "show me the man that can sweep the floor properly and I will show you the man that can build the house" ..... he was right, if you can't sweep the floor properly, there's no way you can build a house. I'm certainly no builder but I do recall my hubby (taxi driver) telling me about picking a guy up from a building site/ apartment block in the Pottery rd/ Johnstown rd area about 10 odd yrs ago and he said he wouldn't touch any of the apartments that were being built at that time with a barge pole, as they were not being built to certain standards, something to do with the external wall and internal wall cavity, isn't this what they are saying is wrong with the school buildings ?? If yes ....... Like everything that seems to come to light here it's only the tip of the iceberg. Snowhite wrote: I'm certainly no builder but I do recall my hubby (taxi driver) telling me about picking a guy up from a building site/ apartment block in the Pottery rd/ Johnstown rd area about 10 odd yrs ago and he said he wouldn't touch any of the apartments that were being built at that time with a barge pole, as they were not being built to certain standards, something to do with the external wall and internal wall cavity, isn't this what they are saying is wrong with the school buildings ?? If yes ....... Like everything that seems to come to light here it's only the tip of the iceberg. That list is far from complete, but it shows how the industry has changed as the race for qualifications evolved. It now takes 4/5 people to do what one person used to do and therein lies the problem ..... too many chiefs, too many opinions and too many filling the same space so you end up with chaos as they all blame each other when disaster strikes. All of the above are highly qualified people after being put through a third level course in order to have a label that puts them above a tradesman .... in doing this, they devalue the trades and we wonder why things go wrong ? Or in modern parlance, The Catering Coordinator.